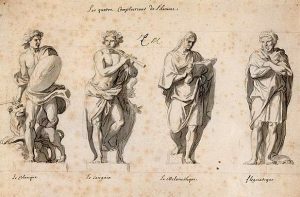 In Shakespeare’s times, personalities were categorised according to four temperaments. The choleric temperament was hot-tempered and active, as Nelly Ekström describes. William Shakespeare’s plays provide examples of all four temperaments, but it’s the cholerics who provide much of the drama. If it was all down to the brooding melancholics, the lazy phlegmatics and the friendly and pleasure-seeking sanguines, not much would happen. 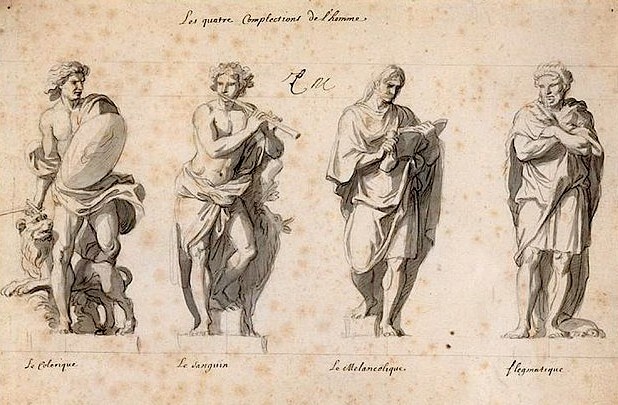 The choleric is the most active of the four temperaments. Choleric personalities are hot, dry, fiery, creatures. At their best they’re ambitious, brave and proud, but they can also be vindictive, deceitful and violent. And without exception, they are irritable and bad-tempered. The typical choleric is lean and quick with dry curly hair (often red). The hot-headed cholerics can never sit still or keep their mouths shut, unless it’s part of a clever scheme thought out beforehand. They often suffer from indigestion and heartburn – no wonder they’re so irritable! Cholerics may seem like an unpleasant bunch, but some of their qualities were highly valued in early modern society. A choleric would never be afraid to draw his sword – physical courage is a choleric quality. But ‘his’ is the essential word here. The two hot, active humours in the choleric personality, blood and yellow bile, were more naturally dominant in men. The two cold, passive humours, phlegm and black bile, tended to favour women. A male choleric might be appreciated for his active and aggressive qualities, while the same kind of behaviour would have made been socially unacceptable for a woman. And when a choleric man and woman met, it could only lead to trouble. 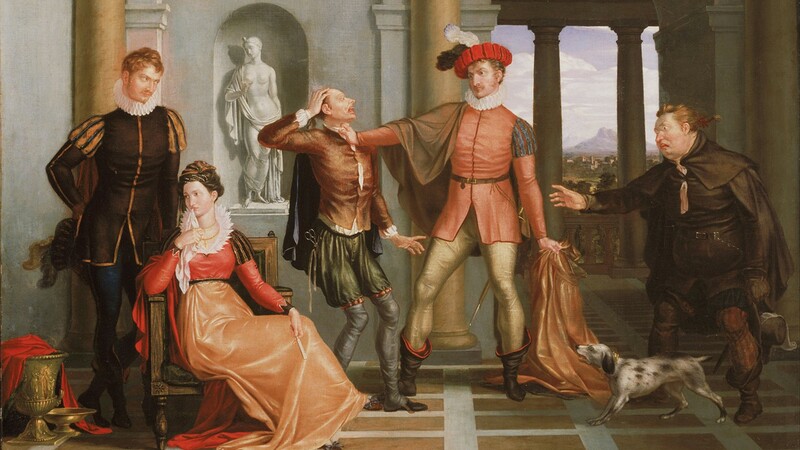 In the ‘Taming of the Shrew’, Petruchio sees it as his duty to make the “wild Kate” conform. Petruchio ‘tames’ Kate by dragging her away from her family, starving her and taking her clothes away. In today’s terms this is an abusive relationship, but from an Elizabethan point of view, to restore balance to an overheated choleric (woman), it’s pretty much what the doctor would have recommended. Stay away from heat and take off clothing to cool the body, and avoid warming, drying foods like bread and red meat. When Petruchio throws a dish of mutton from the table, one excuse he gives is that they’re both choleric. 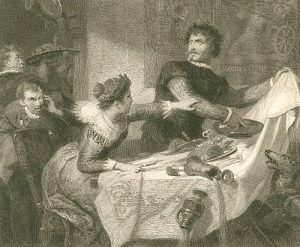 Many of Shakespeare’s characters fainted or died from extreme emotions. Everyone was at risk: both sexes and all age groups are represented. Too much of any emotion – fear, anger, joy or grief – was dangerous. Extreme emotions were caused by extreme changes in a person’s humours. An excess of yellow bile, for example, could result in an excess of gall and a bitter and angry spirit. Controlling the levels of your humours to keep them in balance was the most important way to keep yourself healthy and of sound mind. But the bitter yellow bile that inflamed your spirit and sparked action was just what some characters wish for. The melancholic Prince Hamlet regrets that he is too pigeon-livered and lacks the necessary gall to avenge his father’s death, unlike the more choleric Laertes. 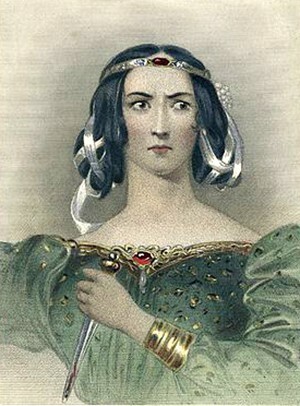 Lady Macbeth is a fairly ‘balanced’ woman at the beginning of the tragedy ‘Macbeth’. But when she finds that the three witches have foretold that Macbeth will be king, she begs the spirits to change her. To achieve her ambitions, she needs the rage and ruthlessness of a true choleric. With all that restless energy, it’s hard for people with an excess of choler to relax and find peace, and they often have sleep problems and nightmares. In the case of Lady Macbeth, a doctor is called, but since Lady Macbeth has defied nature to change her temperament, she’s beyond the help of any physician. This entry was posted in History, Literature, Medicine, Medieval, Middle Ages. Bookmark the permalink.